Compulsory or not, the U.S. Open represented a golden opportunity for Furious. With limited sanctioned-tournament options to fit into our schedule, the U.S. Open provided the Monkey with much-needed exposure to top-flight, out-of-region teams. More to the point, a solid showing could purchase a firm foothold in the rankings. Matches against the top teams are premium chances not to be wasted, and not just for the sake of experience. In the ranking algorithms, win or lose, any given game establishes a mathematical relationship between you and your opponent. For the rest of the season, its influence binds you like an elastic, sharing some measure of each others’ successes and failures. Thus, a match-up against a productive, dominant opponent pays strong dividends – especially if you perform well against them. Conversely, though, a very decisive trouncing, even when it comes at the hands of the best, mostly reinforces the gulf between you. In 2013, with only one major tournament appearance (the Pro-Elite Challenge) under our belts – and a pretty anaemic performance, at that — Furious failed to breach the top 16, and thus the Northwest only barely landed two bids to the Club Championships. Furious still qualified for Texas, through nail-biting means, by no measure comfortably, and necessarily eliminating Portland’s Rhino from contention. * In 2014, we aim to fix that. Now, in the U.S. Open, we were handed a high stakes chance: to prove ourselves against the best, or to very publicly cement our place beneath them. But Furious would not be at full strength, with a roster of 18 and a few nagging injuries to boot. The season is, alas, long and expensive, especially with a trip to Italy on the agenda. As an administrator, just trying to cobble together a competitive roster, in the context of university seasons, world championships, Triple Crown requirements – it all gets a little dizzying. That said, strength in chemistry often trumps strength in numbers, and we see it evidenced all the time. Last year, GOAT won the lofty Pro Flight Finale with a pool of just 16. Furious won CUC 2012 with a roster of 14. I’ve seen tournaments won with less. As long as you can fill every essential role with the right player for the job, the machine remains intact. In this case, we went to great lengths to make sure that every role was properly manned. And lo, the machine worked! 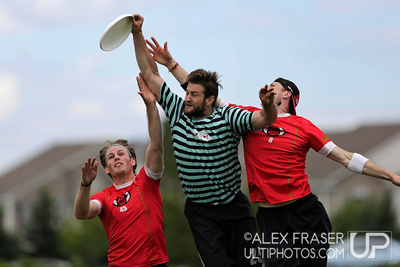 Furious held our own in our opening against Sockeye. For the first time since 2011, we rallied properly against the Fish. We adapted to their cutting patterns, we made adjustments on the fly, and in a late-game comeback, we defeated them. We put up a similarly strong effort against Ironside. Again, we recovered from a first-half deficit, this time through some creative defense, to force a tight endgame. Our offense, albeit somewhat stunted by our transition from the MLU’s Pulsar discs to Ultrastars, looked surprisingly strong and consistent. When you’re shorthanded, you obviously have to be efficient, and energy-conservative. As any captain can attest, though, these are things far easier said than done, so it was a timely relief to see our personnel find their stride. Against Minneapolis’ own Subzero, though we met with the completely unexpected. Granted, we were tired by this time, but what truly caught us off guard was Subzero’s unorthodox arsenal of break throws. Right off the bat, Simon Montague and Eric Johnson surprised us with preposterously unconventional high-release passes. Coupled with a very strong deep game, and fast footwork, they ran up an early lead before we could adapt. They conserved their lead, and expanded it at the finish to a 15-10 tally. It was a disappointing loss, but it reminded us of an invaluable lesson; there are many teams in the world who play very differently from us. To be champions, we have to be able to adapt to what we’re completely unprepared for. Friday morning, we opened strongly against San Francisco’s Revolver, trading breaks and surging to take half on a hotly contested hospital pass of a huck. Revolver, ever the dominant second-half team, though, smoothed out their offense, and later capitalized on a handful of our mistakes to recover the game with a score of 15-12. Colombia’s Evolution carried a roster of superlatively quick athletes, and had the wind been more clement, the game might have gone very differently. But, in a stiff breeze, individual speed takes a back seat to height and throwing finesse, and in those aspects we held the upper hand. The game against Clapham rocked back and forth. It was winnable for us, but in games such as these, a handful of errors – or a few missed opportunities to deliver a big play – typically draw the line between success and failure. On one such memorable miss, we had the disc on the goal line, poised to tie up the game with a break point, and a simple misunderstanding of eye contact on the otherwise correct decision produced the last, crucial turnover. These are unfortunate things, easily repaired, but they can cost games. Saturday morning served up our last match-up and the reigning stars of the tournament at the time. Bravo was leading the field, with a commanding victory over Revolver behind them, and a loss only at the hands of Sockeye. A loss – even a bad one – would not undo the progress we had made, in a mathematical sense. But it was of special spiritual importance that we close this tournament with a show of strength, as much to prove to ourselves that we belonged at this tier, as to the rest of the field. Minnesota summoned driving wind for this one, and it held both teams to account. At first, judicious denial of the open side unders spurred Bravo to turn the disc over on windborne hucks, and Furious closed the first half on an 8-5 lead. But in the second half, Colorado started landing long shots on target, puished our turnovers flawlessly and chiseled steadily away at the score. Although they never took the lead themselves, they drew the game back to a 13-13 match point. Going downwind, on a series of textbook executions, the Angry Monkey settled the match at 14-13. Afterward, a friend asked if I was proud of the result, and our 2-3 finish against the American contenders. I reflected on that, and at length decided that there is a difference between being proud of something, and being happy with it. We entered the U.S. Open with somewhat tentative hopes, unsure of how we would make out, with memories of 2013’s losses and the need to re-establish ourselves in the competitive ranks. In that sense, I am satisfied with the outcome. We made good on the mission; we held the line. I am not proud just to be in the mix; but I am glad to be in a position where pride is on the horizon.